Silver Gulls rarely miss an opportunity for a free feed! I was looking through some images that I shot this morning while on a walk along the rocky shore at Tranmere. I thought I'd photographed a Silver Gull calling madly at my intrusion, as they often do. However, as I looked closer, I realised it was in pursuit of, and about to catch, an insect, as you may see on close inspection of the image at left. The insect in question, is a European Wasp, which it caught, as I saw in the subsequent shot. The Silver Gull joins a growing list of birds that take these introduced pests, if only rarely. The list includes Noisy Miner and Yellow Wattlebird. I frequently feel the urge to get out and go birding armed of course with my camera. This morning's no exception. I keep looking out of the window willing the weather to improve--I think today is worse than yesterday. It isn't improving, but I'm going out anyway. There's a gusty westerly wind blowing, with frequent heavy rain showers, punctuated by short bursts of sun and blue sky. I'm really at a loss to think of a suitable spot to visit and repeat the coastal drive of yesterday. I end up at the foot of the Tasman Bridge, hoping as I arrive, that the Tree Martins might be roosting in the she oak, as they were yesterday. No joy! I stop the car, wind down the window, briefly scan the river, and decide it might be best to give it away. 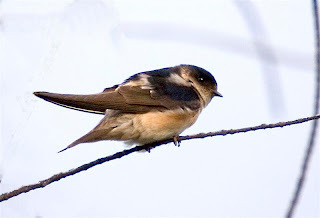 But as I contemplate my next move, I become aware of the unmistakable "twittering" of Tree Martins. They're on the powerline right above me. I manouevre the car accordingly, they fly off (sigh!). There's precious little insect life flying about in these conditions, but they fly low over the river bank searching. I've noted that where they occur in colder, wetter parts of Tasmania, they frequently feed on the ground, rather a case of having to I imagine. Shortly they fly up into THE she oak. I let them settle, then reposition the car. This all coincides with a sunny break, which I rapidly make the most of, as I take numerous shots. The 2 images at right, are the result. Not as good as I hoped (they seldom are) but an improvement on yesterday, and at least it made the morning's excursion seem worthwhile. The upper shot is possibly an adult, but could be an immature bird from an early clutch. The lower shot is of a fairly recently fledged youngster, very much 'fluffed up' against the cold wind. With a light covering of snow first thing this morning on Mount Wellington, and condition less than conducive for birding, or photography for that matter, I decided on a drive round the local coastline. I was hoping to get a few action shots of gulls, but even they seemed to have taken shelter elsewhere. A quick scan of the River Derwent did reveal one interesting sighting, two Arctic Skuas flying up river towards the City, definitely too far away to photograph however. I used to regularly see them as far up the river as Rosny Point, but in recent years you're more likely to see them at the mouth of the river. I moved on to the base of the Tasman Bridge, again to scan the river. As I pulled up, I noted a number of birds roosting in a she oak next to the road. There were probably around 50 or so birds, mostly 'puffed up' against the wind, but looking at them against the sky, made them difficult to ID. Moving the car to a better vantage point, revealed a mixed flock of Silvereyes, Greenfinches, a few Starlings, and around 20 Tree Martins--one pictured. Although the conditions were poor for photography, I just had to try for the Tree Martins as, up to now, they had proved photographically elusive. They're quite common around the bridge, as they nest in the construction holes. Well I managed to get a few, less than satisfactory shots, before something spooked them. They dived out with much 'twittering' and quickly disappeared from view. Ah well, maybe next time! I spent a pleasant hour or so watching, and attempting to photograph, Musk Lorikeets, this morning. This was my second attempt to photograph them in recent days, and somewhat more successful. At the moment they're 'gorging' themselves on the flowering euc. ficifolia, and the odd euc. leucoxylon. Locally, we have flocks numbering a few hundred or so, although individual flocks are usually between 10 and 30 birds. Musk Lorikeets have increased considerably in this area, as they appear to have done in many of the state's suburbs. I had chosen a particular tree in the grounds of the local school, hoping that the lorikeets would be present, and as I approached the tree, I was surprised to be divebombed by a Masked Lapwing. These common Lapwings ha ve usually long finished rearing young by now, although I recall a pair with a single chick at this time last year, barely a kilometre away. Shortly after the divebombing, I noticed a large Lapwing 'runner', doing just that, disappear round the wall of the school, and the attack ceased. Nearing my target tree, I could hear the lorikeets screeching, and felt quite elated at their obvious presence. This proved to be somewhat premature, because, despite what I thought was a careful approach, they took fright and with much shrieking, they too disappeared behind the school building! While I was standing there, considering my options, a few birds returned, so I was in business. While trying to get shots of these restless feeders, I made a number of observations. Most of these birds appeared to be paired, and called to one another as they fed, although to my ear, all calling birds sounded the same. Most of the time, they chose to feed inverted, climbing to the top of a flower cluster and hanging vertically, while they fed with a scything action, using their tongue to pick up the nectar. I did wonder why they chose this method and concluded that since their upper bill was larger than the lower, this might be more efficient. Well it's a thought. If another flock descended onto the tree, the 'resident' birds often increased the speed of feeding, often reaching what might be called a frenzy as they rushed from one flower cluster to the next. Quite amusing to watch, very difficult for photography! They are very agile, and can effectively 'run' through the small branches, quite a feat for a bird with a very short tarsus. The display that the bird is exhibiting in the lower left photo., a spreading of the tail, sometimes accompanied by a shimmering of its' wings, appeared to be a 'hands off' warning to other birds. Possibly one male to another, although that is supposition. Certainly there is a lot of aggro between birds, accompanied by harsh calls, and occaisonal brief fights. All in all, an absorbing morning. Couldn't wait, on Friday morning, to get out and give my latest acquisition (a new lens) another airing. In fact the day was far from conducive to getting good photographic results, but you know what it's like when you've got a new bit of gear! Anyway, much of the morning was taken up with finding what works and what doesn't. This was particularly aimed at formulating a technique for photographing birds in flight, always a challenge. I chose the flock of Red-necked Stint at Pipeclay Lagoon as my subject, knowing that by the time I got there the tide would be dropping and the roosting stint would soon be dispersing to feed, and that my presence would cause minimal disturbance. A couple of the (many) shots that I took, are shown here, and I'm not really sure that I yet have a viable methodology, but I'm working on it. A liitle sun would have helped! It was while taking the shots, that I realised just how amazingly manoeuvrable these birds are on landing. I'm sure we've all watched, probably in some awe, as large flocks of birds twist and turn in unison, in a rapidly changing mass. But have you ever stopped to think of the difficulties that mass landings present, if it isn't going to end up in a shambles? There was about 200 or so birds in this flock, but flocks reach many times that in size. The technique seems to be that the first birds to arrive move forward after landing, allowing space for the later arrivals, but it must be fine judgement and flying skill that makes it all work. I can recall seeing a mixed flock of some few thousand waders, at Broome, trying to all get onto a flat topped, offshore rock, that could only hold half their number. The result was that, as early arrivals made way for incoming birds, they were eventually forced off the rock. They then proceeded to circle round and join the incoming birds, and they in turn, forced others off the rock. Quite amusing in its' own way, and it took them a while to sort themselves out and find other roost sites. I visited Orielton Lagoon this morning, with the express purpose of trying out a new lens I've just acquired. New gear testing is always a red letter day, and the eastern side of the lagoon with the tide in, usually holds good numbers of small waders, many that I've blogged before. While talking to a West Australian couple in the area adjacent to the lagoon, a vehicle pulled up and the unmistakable figures of a couple of birders piled out, armed to the teeth with bins and scope. This is a fairly unusual event for me as birders are a bit thin on the ground in Tassie. What's more, I recognised the male of the species as being none other than John Tongue, a regular contributor to this blog (and organiser of the "Twitch"). It might surprise some, that in fact I've never met John before, even though I feel I know he and his wife, Shirley, as we correspond regularly via e-mail. They and their 2 children were on the "Great Tassie Twitch", having travelled down this morning from the East Coast on their quest. I think they managed quite a few more tic ks at the lagoon, including the rare bonus of a Royal Spoonbill on Suzie Islet. Pictured here, apart from the Tongue family, are 2 Pacific Golden Plover in flight, and a solitary Red-necked Stint, as well as part of the flock of around 300 Red-necked Stint roosting on the lagoon shore. The lens came up to my expectation too! I've noticed over the years, that some birds seem to be attracted to the galls commonly found on acacias. On the face of it, these galls seem particularly unlikely to be a food source for small birds. Patently most of them don't have the means to break into them, so why the interest? Well I've looked at many of them, and the only thing I've commonly found, are minute white grubs. These grubs, no more than a couple of millimetres long, are secreted in the crevices, no doubt many other insects find shelter there too. Whether the grubs are the food source I've never been able to ascertain. Neither do I know whether they are in any way associated with the insects that cause the acacias to form galls in the first place. Silvereyes seem to be the main species that seek food on the galls, but photographed here, is a Black-headed Honeyeater. This bird, was one of a family group that took it in turns to search the galls. Has anyone else seen birds on galls, or knows what they are feeding on? A review of the species list recently, showed that I have never 'blogged' images of the Hoary-headed Grebe, so I'll remedy that. The photo shown here, was taken at the Risdon Brook Park, this individual allowing me to almost get near enough to take a decent shot. Hoary heads are by far the commonest of the grebes seen in Tasmania, often being seen in small 'rafts', fishing together. They're commonly seen on farm dams, lakes and estuaries around the state. Relatively small numbers of pairs seem to breed here. Some appear to be nomadic, with numbers at any one spot fluctuating considerably. I've only occasionally seen them flying in flocks, so perhaps they mostly move at night. Immature birds lack the hoary headed look, as do the adults in Winter. 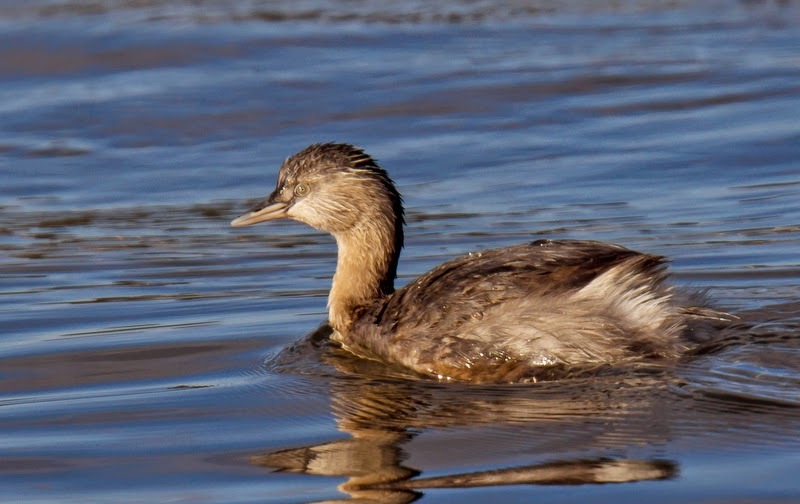 The similar sized Australasian, or Little, Grebe, is relatively uncommon, mostly seen in pairs or small groups, on small bodies of fresh water, such as farm dams. It does seem to be increasing in numbers and regularly breeds around SE Tasmania. These two small grebes are occasionally seen together. The Great-crested Grebe is arguably the rarest of the 3 grebes. When Lake Dulverton, at Oatlands, held a consistent amount of water, breeding regularly occured. In one year, in the 70's, as many as 8 pairs nested there. I'm unaware of any breeding records of late. In recent years they have been seen at Orielton Lagoon, Blackman Bay, the River Derwent around Bridgewater, and on the River Tamar in the North of the state. A Family Outing to Waterworks Reserve. On Wednesday of last week, before the very welcome rain, we had a family outing to the Waterworks Reserve. For some reason, I never really think of this reserve as being particularly good for birding. Perhaps it's because this is a justifiably popular park, with barbecue and children's play facilities, and I don't generally think of crowds and birding as being especially compatible! By coincidence, Don Knowler, writing in his column in the Mercury Newspaper yesterday, considers it one of the best sites for birding in the Hobart area, and I'm sure he is right. We were there early and decided to walk up to the Gentle Annie Falls, although the amount of water in the creek suggested that there wasn't likely to be any "falls". The chances of taking any photographs or seeing many birds, seemed slim, as we had our 5 year old granddaughter with us, and her idea of quiet and mine aren't quite the same, but it was a family outing! In fact, perhaps because so many people do use this track, the birds have become accustomed to them, and they were fairly accomodating. Superb Fairy-wrens, Silvereyes, Grey Fantail, and a less than retiring Tasmanian Scrubwren (photo at top right) were seen and some photographed in the first few metres. On the western side of the hill, we could hear calling Pallid, Fantailed and Shining Bronze Cuckoos, Satin Flycatchers, a passing flock of Strongbilled Ho neyeaters and a strident Yellow-throated Honeyeater. Moments later, a Brush Bronzewing flew out of the creekbed, missing all by inches, followed by 2 Green Rosellas. I elected to stay at the bridge hoping to see Tasmanian Thornbills, which turned out to be in vain, although I'm sure they occur here. I also omitted to see which way the rest of the family went, and in the event, chose the wrong way and ended up back at the park, mainly because I was rather anxious not to miss out on all the food. There are other priorities in life apart from birding. Wandering back, I recorded several other species including Tasmanian Native Hens and Grey Currawongs and then spent sometime watching the Kelp Gulls and their diving approach to the water, noting a solitary immature Pacific Gull among them. 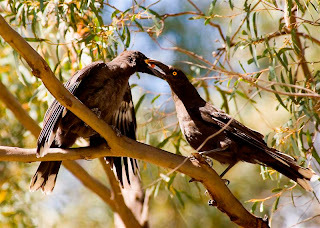 Later, reunited with the family (and the food), I watched a family of Black Currawongs, they too feeding their young, only a matter of metres away. The youngsters begging, with wings 'shivering', before each feed, which consisted primarily of Native Cherries, as you may see in the image. Not long before we left, the Forest Raven (photo at bottom) flew into a nearby tree, and did verbal battle with several others in the area. This gave a fairly rare chance of getting within 'camera' range. We recorded 32 species in all, and that was really without putting any real effort into it, and that included 6 Tasmanian endemics. I think it could rightly claim to be one of the best spots for birding around Hobart. An early start is recommended. Fight! Fight! Pied Oystercatchers at Odds. On the morning of New Years Day, with somewhat overcast conditions and a bit of sea fog about, I decided to look for waders along the eastern shore of Pipeclay Lagoon. This is sometimes a good spot for photographing waders, as you can use the car as a hide. As I approached the oyster sheds I came across a flock of about 15 or so Pied Oystercatchers, some in the middle of the dirt road. The y were doing their 'piping display' ( top left) and seemed oblivious of my approach, so much so that I had to ease the car through the flock. Most will be familiar with this very vocal display, most often performed between adult birds on adjoining territories. I turned the car round, so that I could watch/photograph this performance, and the ensuing images are the result. The shots are in the order that I took them, starting at 08.19 and ending at 08.27, (another advantage of digital photography!). As the birds performed their piping display, only a few metres from me, I realised just how 'hyped' up they were. With head down and 'piping', they picked up shells and small stones, tossing them sideways, as they eyed off rivals. Two birds became particularly agitated and one ran at the other, resulting in the apparent 'head stand' of the second shot. From that point on the fight degenerated to an all in brawl, and they slowly moved away from the rest of the flock, and subsequently into the sea. I've always thought of Pied Oystercatchers as being a little pugnacious with one another at times, but this was one of the few times I've seen it get that serious. The last image, sees the loser flying off, to be pursued briefly b y the bird in the water. I can't tell you specifically what the fight was over, but assume it was over one bird trying to usurp the other's partner. I don't even know whether the protagonists were male or female, but presume they were most probably both males. If you want to fully enjoy their antics, I recommend you click on the images to enlarge them. An interesting 8 minutes of action!